The beautiful white sand and big ocean waves are just what you need for your vacation at the beach. But be careful of the danger lurking beneath the waves, there are ocean creatures just waiting to attack. There were more than 1,200 shark attacks in the last decade, although only 95 of them were fatal, according to the Global Shark Attack File, on which the following list is based. Between 2008 and 2018, the U.S. had 580 shark attacks, the highest of any country, with 284 of those happening in Florida. The country that had the most attacks after the U.S. is Australia with 256. Some common sharks are found in shallow waters. 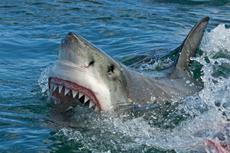 Great White Sharks prefer to stay in deep waters. Blacktip Sharks can be found in groups and appear in shallow water. Spinner sharks are extremely fast and like to jump out of the water. And Tiger Sharks are very curious, aggressive and have an excellent sense of smell. It is worth noting that, overall, shark attacks are not so common. According to National Geographic, for every human killed by a shark, humans kill approximately two million of the “super predator.” Many experts say that you are more likely to be struck by lightning.